When you go into the Shark Tank you best have your Game Face on. That's exactly Doug Marshal, owner of the Game Face Company intends to do. The GameFace is one of those inventions you wonder why it isn't already more popular then it already is. It's a temporary face tattoo that's like having a professional painter paint your face perfectly every time. Game Face Tattoo Company will completely eliminate those messy paints or uncomfortable masks that always seems to get in the way. The possibilities for this product will become enormous as more people discover the Game Face temporary tattoo's. What started out as face tattoo's for college football is quickly expanding to many other areas as well. Professional sports teams are lining up to get their teams colors made into a Game Face. What about the biggest night when people dress up and usually wear a mask on Halloween? Sure you may wear that mask for a little while but it will ultimately get in the way. With a Game Face mask on this will completely eliminate this problem. In 2009, the U.S. consumers spent approximately $5.8 billion on Halloween Night. This is a huge market that the GameFace Company could take a large bite out of. Look for the Game Face costume tattoo's in stores next Halloween. The Game Face currently has dozens of Face Tattoo's already available in several categories including the Costume Face, the Flag Face, the Sports Face, the Camo Face and the Girl Face. I would imagine this list will continue to grow as this product starts to catch on in different areas yet to be explored. Doug Marshal auditioned for the Shark Tank way back in May of this year and has been patently waiting to see if the GameFace Company would even make the final cut and be shown on T.V. It's been a long time coming but that day is almost here. So far the most popular temporary tattoo's have been at sporting events where many people already paint their faces in the teams colors. This would lead to Mark Cuban as the logical Shark to be interested in GameFace as a business partner. Can you imagine going to a Mavericks Game where Mark gave away a GameFace tattoo to whoever wanted one? The publicity would be priceless. Of couse the next team they played away from home would need to return the favor. 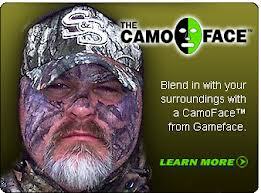 Yes, the Game Face Company has the potential to be Super Successful especially with the help of the Shark Tank Show. Given whats shown on the sneak peak for the show, I sure hope Doug Marshal doesn't over value the GameFace business right out of a deal. A $1.8 million valuation with only $30k in sales? These figures look very similar to the Partie Poche seen just a few weeks ago and we all know what happened to them. A product with mass appeal, a super low price point ($5) and covering several verticals throughout the year could easily lead to one of the Biggest Deals Ever In Shark Tank History. It may take a year or two, but the GameFace Company has everything it takes to become a household name. It's really hard to imagine the Sharks will let this one get away. Update: On the GameFace Facebook page it just so happens to have a video from a Mavericks Game where they are wearing Flag Faces filmed just a few weeks ago. Coincidence? Need more variety NFL Teams/ College Teams/ Halloween inspired. Congrats to Mark Cuban on investing with Doug and the Game Face concept. You both will do very good in your partnership. Great Idea. is there any way to make a "game face" that looks like a fair skinned woman wearing makeup? I own a dance store in Canada. Very interested in these. The little girl with the butterfly face was fantastic. Do you have any other ones that would work for all the dancers on stage.This product would cut out so much time for the mothers and teachers! Fantastic. 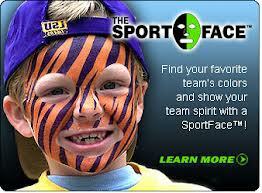 Please make a orange and blue tiger face tattoo for the Auburn Tigers. War Eagle! Great post! Can't wait for the season to start, let's go Bucks! So I just went to your website and most of you NFL faces are sold out? That's not any way to run a co.